We will sample both actual specimens and environmental DNA to analyse the species composition using DNA barcoding. Below is a brief overview over methods used. 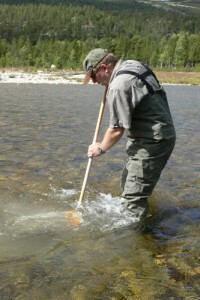 Karstein Hårsaker is kick-sampling the Atna River. Photo: Torbjørn Ekrem. The EBAI project employs a typical sampling method for streams and rivers, which involves a four minute kick sample using a 250 µm mesh net with a 25 cm opening and 15 cm long net sack. The net is placed on the riverbed and the different habitats upstream of the net are disturbed by kicking with foot, sweeping through vegetation and turning and rubbing stones with hand. The contents of the net are released to a bucket and shaken to separate most of the debris from the sample, which is then fixed with ethanol. 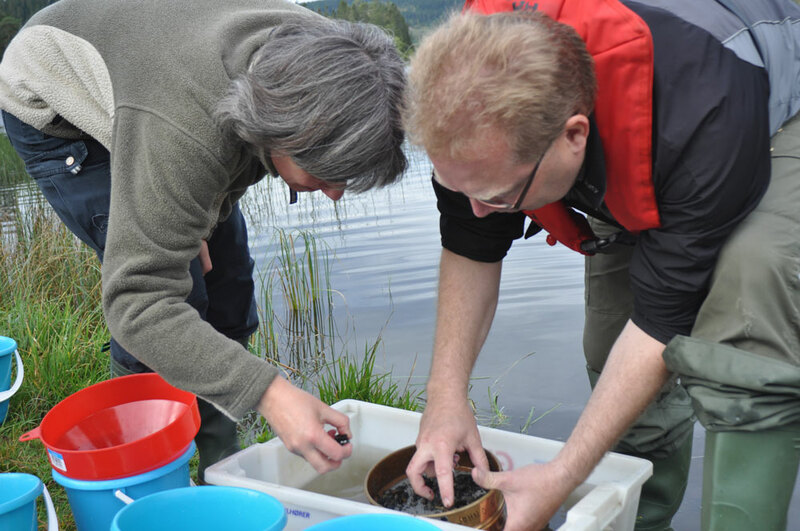 The lake benthos is sampled with Van Veen sampler that is lowered to the lake bottom from a boat. Using Van Veen sampler, up to 20 cm deep samples of roughly 0.1 m2 can be obtained. The sampler is spread like an open scissor when letting it down into the water, and closed when hitting the bottom and pulled upward. After sampling, the sediment is sieved through a 250 µm mesh, and animals are collected and fixed with ethanol. 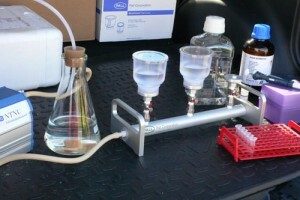 Mobile water filtering setup. Photo: Torbjørn Ekrem. Stream water is sampled with sterile bottles that are lowered in the stream facing upstream. The lake water is sampled using a water sampler lowered to the desired depth and closed with a messenger. Water samples are filtered using a vacuum manifold system using individual sterile bottle-top membrane filters in variable mesh size (0.2 µm, 0.45 µm). 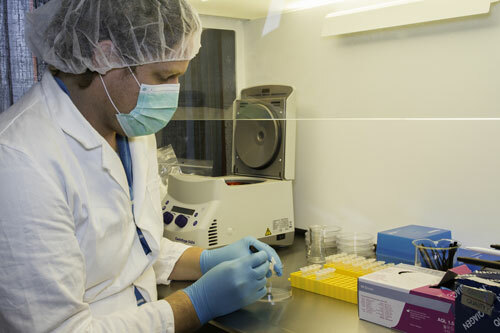 Filters containing each sample are placed in tubes and kept at different conditions (ice, silica gel, extraction buffer, absolute ethanol) until DNA extraction. Erik isolating DNA from filtered water. Photo: Per Gätzschmann. on several issues e.g. the material available, the cost and time available. Three components are necessary for successful extraction: 1) inhibition of enzymes that destroy DNA (nucleases), 2) removal of proteins, and 3) physical separation of DNA from other cellular components. The easiest way of doing this is using commercial DNA extraction kits. The next step is to amplify the targeted COI gene sequences of the samples. This is achieved by polymerase chain reaction technique (PCR) that allows unlimited amplification of the targeted gene region. The principle of PCR builds on the natural DNA replication by DNA polymerase. Other main components required for PCR amplification include 1) two synthetic, usually 15-25 bases long oligonucleotide primers, which match the end sequences of the targeted gene region, 2) buffering agent and ions necessary to the reaction, 3) nucleotides A, C, G and T, and 4) the sampled DNA. When the ingredients for the reaction have been mixed they are placed in a thermal cycler where the reaction is subject to three temperature steps that amplifies the desired DNA fragment. A sequencing instrument that allows separation of fragments from different species reads the amplified DNA fragments. The EBAI project will use Illumina MiSeq platform for sequencing. The resulting collection of sequences can then be compared with existing barcode reference libraries. Parts of the samples will be identified by traditional means while different other parts will be identified through DNA barcoding. For the comparison of sequences with the reference library to be meaningful, bioinformatic tools are used to clean and filter noise and nonsense sequences from the results of the sequencing runs. Various pipelines to treat raw data from sequencing instruments are available and new are continuously being developed.